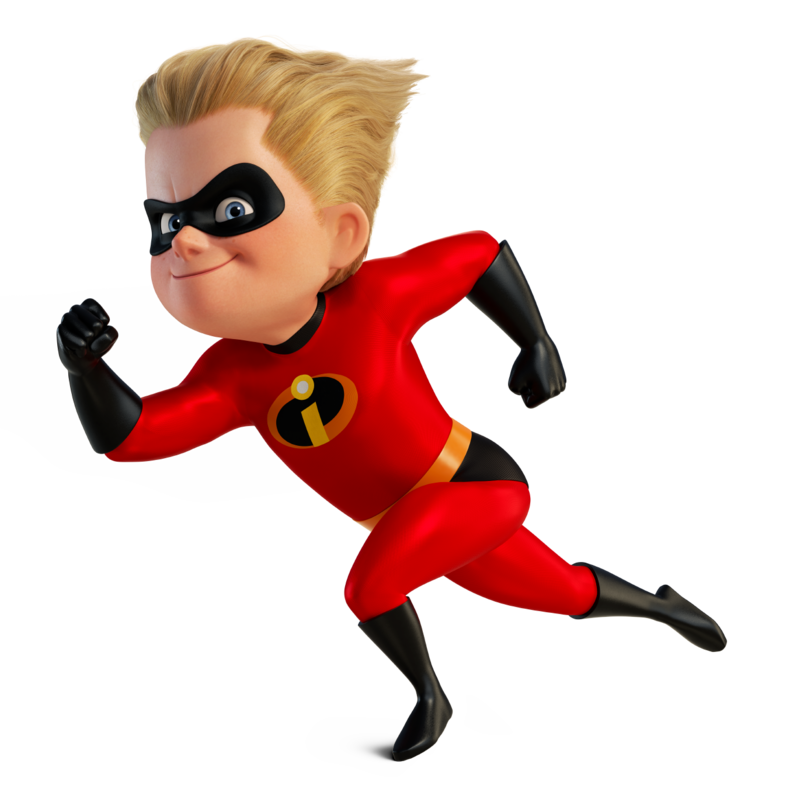 Incredibles 2 © Disney / Pixar. All Rights Reserved. 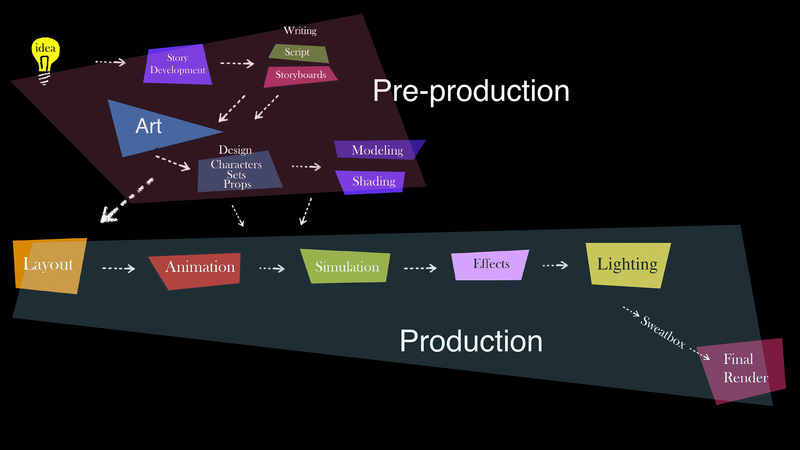 Pixar has built a versatile and extensible artist workflow throughout the years, which has always focused on artistic and technical innovation. 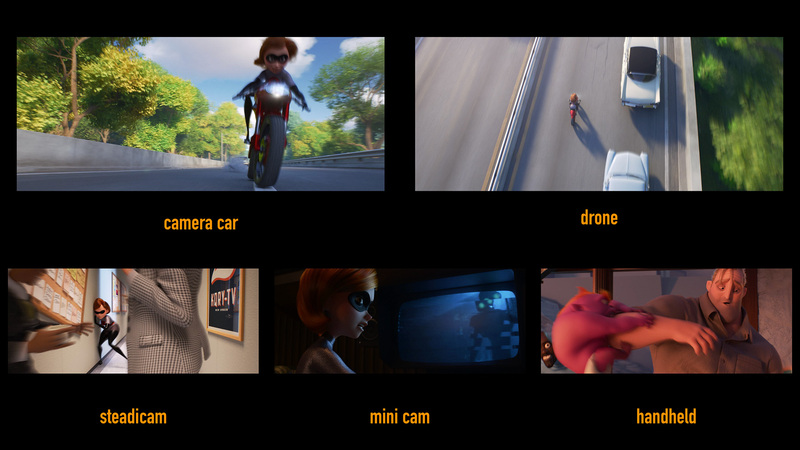 For Incredibles 2, director Brad Bird wanted to take the technical recipe in a new direction by asking for lighting and workflow techniques traditionally reserved for live-action films. This innovative approach allowed the production teams to work faster, collaborate in new ways, and ultimately helped define the final look of the film. 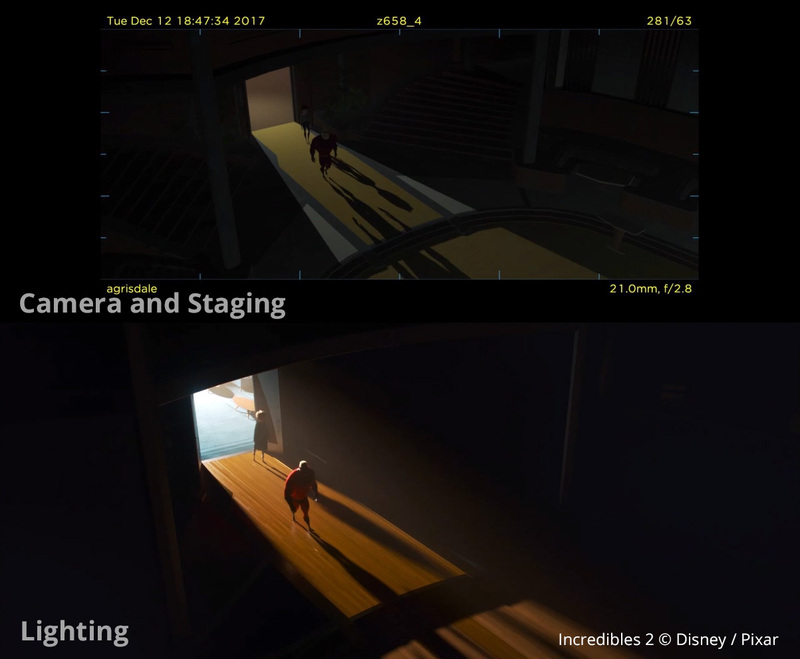 To execute this change in the pipeline status-quo, Erik Smitt, Lighting Director of Photography for Incredibles 2, and Mahyar Abousaeedi, Camera and Staging Director of Photography for Incredibles 2, collaborated in new ways to surpass Brad’s expectations and lead their departments towards the film’s signature look. 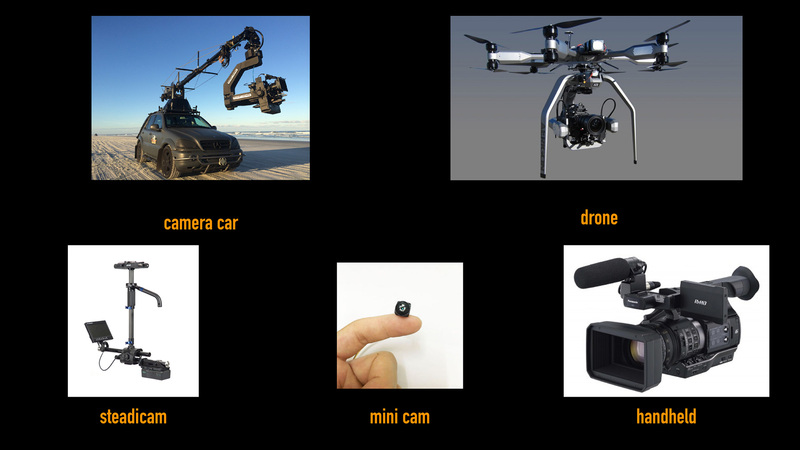 Adopting workflows from live action films presented new types of challenges which required new solutions, and the compressed production schedule didn’t help the pressure. Early in production Incredibles 2 was moved a year ahead of Toy Story 4, shaving a precious year off production. This presented tremendous challenges for the lighting team led by Erik Smitt and the Camera and Staging department led by Mahyar Abousaeedi. When we contrast the above chart with the new workflows for I2, we can see that live action techniques allowed departments to collaborate in new ways, which helped them succeed under their tightened schedule. This looks hectic, but collaboration can be! As expected, this change in schedule created a huge pipeline shift and consequently an interesting new approach which prioritized collaboration above traditional workflows, facilitating communication and problem solving. “The Producers wanted to design a pipeline that meant less director reviews per department and more reviews watching our work in context. Many departments were encouraged to collaborate, and to set the tone of this pipeline, the Story Department opened up their doors during director story pitches at the beginning of production. This gave us a chance to plan with relevant story context, and really paid off when we were under the gun” said Mahyar, Camera and Staging Director of Photography for Incredibles 2. This pipeline change presented opportunities for the the lighting department to reevaluate their workflow and create new solutions. “Large shifts to an established working method are risky, but our emphasis on collaboration was the best thing for the whole show. We’re best at innovating in times of need, and losing 1/3 of the production schedule provided us all with very open minds. Working with the status quo but 33% faster was not a realistic option, so across all departments we rethought our traditional approaches and developed a workflow that was both creatively satisfying for the artist and more efficient. This allowed us to put more of Brad’s vision on screen than we would have had the time to do otherwise,” said Erik Smitt, Lighting Director of Photography for Incredibles 2. “Collaboration was a key element for this show,” said Mahyar Abousaeedi. The layout department teamed up with the lighting department in order to encourage Brad’s cinematic feedback early on. Since 2004’s The Incredibles, workflows for layout, rough lighting, atmosphere, effects, and crowds have evolved, giving director Brad Bird a myriad of new tools, which added a great amount of creative and production complexity for Incredibles 2. “Layout artists have a lot more weight to carry in this type of production, but we felt supported by our Manager Mike Capbarat and Coordinator Nick Roberts to design a schedule to accommodate this workflow,” said Mahyar Abousaeedi. Lighting created light setups placed in physical locations, and layout artists would use those lighting ideas to help guide the director’s eye, complete a composition, or express a tone that might be relevant. “While a Presto recording is pretty unpolished compared to a final render, you can still understand the seeds of our cinematic ideas at this early stage. This not only allowed us to receive broad tonal notes from Brad very early in the process, it helped inform our friends in every other department how their work will be seen,” said Erik. “Cinematically, we wanted a common language across the whole film, and then exaggerate that style in our action sequences." The FX department also benefited from this newfound collaboration. “Explosions, fireballs, debris, dust clouds…Brad called these ‘popcorn and soda’ moments, and it wasn’t going to be a fun layout review if we had wimpy FX, so the FX department provided assets to help guide the timing of countless events which informed our staging and choreography,” said Mahyar. “This context not only helped sell layout by planting visual consequence, but it also provided FX a huge head start by nailing down rough ideas much earlier that we would traditionally,“ added Mahyar. One of the priorities was to respect the visual language of the first Incredibles, while expanding on it. “Having not worked on the first film, we wanted to understand the limitations of the cinematography that gives the world its signature feel,” said Mahyar. “For example, Brad would often say ‘hit the deck’ which is indicated here by these low horizons….a sweet spot for Brad,” he added. “Another common choice was shooting medium-shots or two-shots from waist height. Again, this pushes the horizon lower, and Brad tends to like shooting his actors at a slight up angle,” said Mahyar. Striking a balance between modern camera language and still photography helped captured the style of the first film. “One thing I knew about Brad’s aesthetic from working with him on Ratatouille, is that he is particular about the physicality of our camera movement, and understanding who the camera operator is,” said Mahyar. “Although traditional camera operations were favored for much of the film, Brad’s live action lingo was coming through in the boards and how he directed us, so we expanded on those styles once we began shooting the film by having a broader range of operation techniques,” added Mahyar. Since the original Incredibles was released in 2004, technology has made tremendous advancements giving artists better tools for creating exciting performances and more believable worlds. “Brad’s directive to us was to be inspired by the first film, but not shackled to the details of it. So while we’ll capture its terrific sense of mid century modernism and idealism, we had license to expand the palette with both the new technology and filmmaking skills the studio had developed in the fourteen years since the original movie,” said Erik. A lot has changed in 14 years! 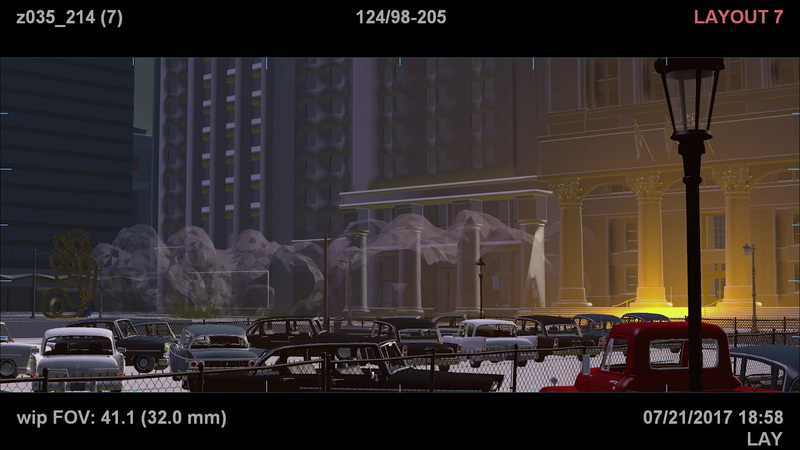 One of the pioneering rendering technologies for Incredibles 2 was Manifold Walk, a new method for calculating caustics on very thin geometry, such as through the cornea of the eyes. This was helpful to bring characters' expressions to life, and required far fewer cheats to bring out the richness of our character’s eyes in each shot. New advancements in hair rendering were also key for added realism, making characters more believable than ever before in a Pixar film. The Pixar research group lead by research scientist Christophe Hery collaborated with the RenderMan Development team, lead by Max Liani, to redesign a new curve description which lead to massive reductions in memory usage and better leverage the improvements in multi-scattering algorithms developed by Hery’s group. This collaboration improved the look of the hair throughout the show, especially low melanin (blonde) hair which is heavily dependent on multi-scattering, improving realism in Dash’s hair for example. 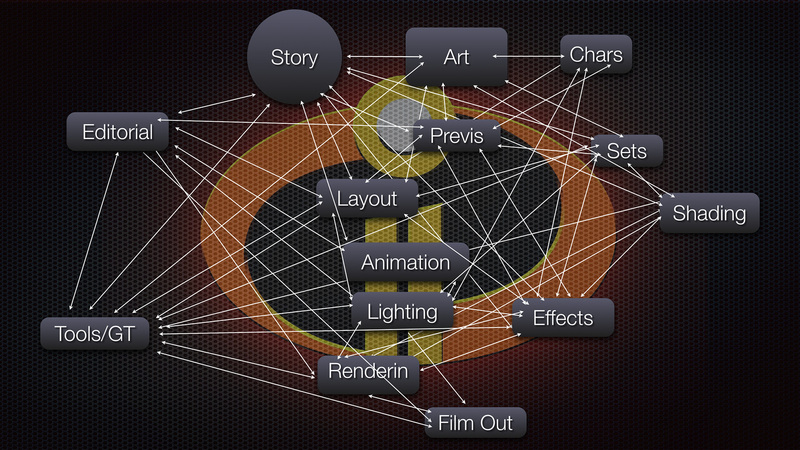 Tying all these technologies together is the Pixar Unified Integrator, also developed at the Pixar research group. Battle tested since Finding Dory and now included with RenderMan version 22, Pixar’s production integrator has the capability of terminating rays in new and efficient ways, including the capability for guiding indirect rays and using light learning to sample difficult areas more efficiently. These technologies gave artists new ways to get creative with this new live-action workflow by using indirect lighting as a storytelling tool like never before, which meant being able to light sequences with fewer lights and more predictable results. In terms of film grammar, there was a theme from the first Incredibles film that became really important: the notion of the ‘incredible vs the mundane.’ The Story Team had a rule on the first film, something amazing should be followed by something uneventful and familiar. This juxtaposition made sequences fun and relatable, and most importantly brought family dynamics into focus. “Plotting out Incredibles 2, we have a sequence called “pillow talk.’ Helen accepts Deavor’s invitation to prove Supers should be legal again, which takes her through a kinetic journey in the second act. Visually, this was contrasted by Bob’s static experience at home. To support this idea, camera moves are minimal or locked down with Bob, and far more operated and dynamic when choreographing Helen. So while we see Helen actively pursuing trains and helicopters, Bob is at home reading bedtime stories and serving waffles,” said Mahyar. This phenomenon can be seen in this intensity chart. Notice the contrast of dynamic vs stable lighting and camerawork per-character. This dynamic would be subtly brought into a sequence. “Cinematically, we wanted a common language across the whole film, and then exaggerate that style in our action sequences. For example, in a familial scene, the lighting would feel fairly grounded and authentic, but in our action scenes we would increase the contrast and color even though we would start with a similar lighting foundation, this would communicate a ‘comic book’ feeling,” said Erik. This subtle transition can be seen in the image below, as Helen receives the call a slight blue rim light and stronger key light foreshadow incredible events and hint at a “super” inner-dialogue. Lighting highlights the differences between the "Incredible and The Mundane"
Good lighting communicates intent. It denotes mood and guides the viewer through the scene, signifying focus and story through pattern, color, and directionality. 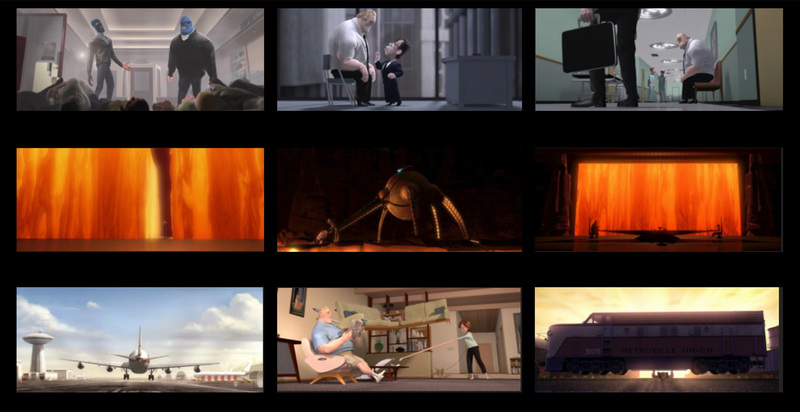 Incredibles 2 used many live action references for its look, including many great 20th century films lit with a theatrical aesthetic. We can separate the motivations for Incredibles 2 into 4 categories: Shaped Light, Silhouette, Light Quality, and Atmosphere. The use of shaped light is very useful for creating tangents which provoke tension and add structure to the frame in order to guide the viewer’s eyes. “These cinematic techniques were commonly used in films of the 1960’s, and helped us add a feeling of period authenticity,” said Erik. It is a crucial storytelling technique which can be achieved with RenderMan’s blockers and light filters. A silhouette can quickly set the tone or mood for a scene. It brings mystery to the subject as little facial expression detail is shown, putting focus on the emotion of the composition. RenderMan’s light transport can handle indirect lighting automatically, making subtle direction choices more predictable. Light Quality can manipulate a character’s form in a variety of ways to set mood or tone. Incredibles 2 used lights of varying sizes and profiles, mimicking a fresnel lens, this helped create interesting shapes which added variation of shadows and patterns in the scene. Erik added, “A small, bright light on a character’s face will evoke a very different emotional response than a large, soft one.” RenderMan supports IES profiles to create unique and varying patterns in the scene, which can be accentuated even further with light filters. Creating a sense of richness and volume in a scene can be achieved with Atmosphere, which can be a crucial compositional element to achieve any of the aforementioned lighting techniques. Atmosphere can be created in RenderMan using PxrVolume, a sophisticated volume shader for heterogeneous, homogeneous, or emissive volumes. In the end, Incredibles 2 was an example of taking Pixar’s collaborative and problem solving spirit to new heights by leveraging the best ideas from all departments and embracing new challenges. “Many artists, both technical and traditional, collaborated in testing and optimizing the technical developments, some even hopped in from other ongoing projects in order to help meet expectations,” said Christophe Hery. This level of cooperation exemplifies the ongoing commitment to innovation on every movie at Pixar.